When John Pye of Gibson Farm, Quernmore, Lancashire decided to enter his 16 year old cow, Quernmore Buttercup 120 into Cogent’s Best of Visions competition, the judges were full of praise for his system and management style. So it really was no surprise that, when John was shortlisted into the next stage of competition, he quickly fought off tough opposition and was crowned the overall winner at AgriScot 2015. 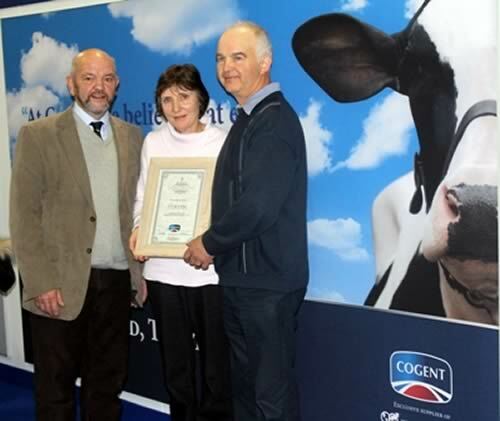 The Cogent Best of Visions competition aimed to celebrate 20 years of the most robust progeny testing programme available in the UK and throughout the summer, the search was on to find the top the top daughter born since its launch. Buttercup, a Meadowstream Ebony Coni daughter, thoroughly impressed judges as a strong, long lasting cow with a desire to milk and John was presented with top honours at Scotland’s premier agricultural event. "To be announced the winner of the Best of Visions competition is a real honour." "Seventeen years ago, we purchased ten straws and Buttercup is the last left in the herd which is a true testimony to both her and Cogent. Quite simply, Buttercup sums up the vision of a good, hardworking cow. At 15 she was classified EX92 and even now she has a one track mind to just keep on milking. She really is the family pet and we could not be more proud."